You wouldn't hesitate to carry insurance for your children or spouse, but what about the furry creatures who hold an precious spot in your family’s heart? If you could, would you buy insurance for your pets? Pet insurance is an actual product that can help you control the cost of treating your pets when they are sick or injured and ensures that a beloved animal never needs to go without medical attention for financial reasons. Facing pet medical bills can be overwhelming and in a rough economy, pet care is often last on the list of priorities. But with pet insurance, you can help ensure that your beloved pet has the care it needs at a price you can afford. 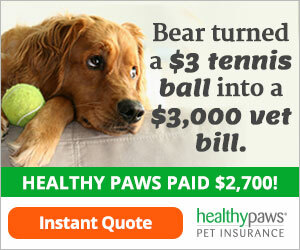 Read more about pet insurance here. For a free, no-obligation quote, please click on the Instant Quote button above or call 1-888-512-8878.